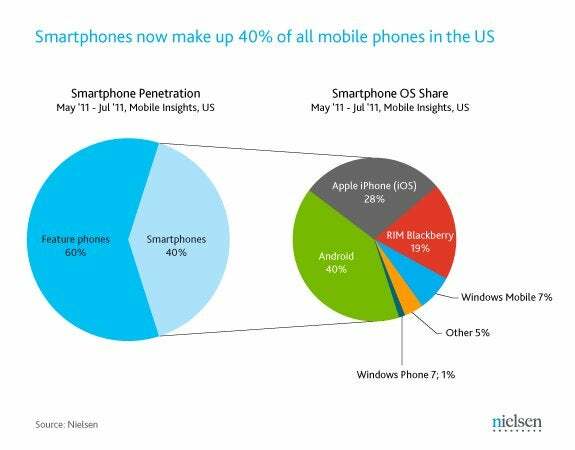 The smartphone wars are heating up, as 40 percent of mobile-device users in the United States now own iPhones, Android devices, or BlackBerrys instead of feature phones. Handsets powered by Google's Android OS are still tops among American smartphone owners, taking up 40 percent of the market. The iPhone is a distant second at 28 percent, while BlackBerry has dropped to 19 percent of the smartphone market in the U.S., according to the latest survey from the Nielsen Company. Among those shoppers looking to purchase a smartphone in the next year, Android and the iPhone each claim about one-third of potential new buyers. But when you break users down into different groups based on their willingness to adopt new technologies, Android ends up leading in several categories, according to Nielsen's findings. 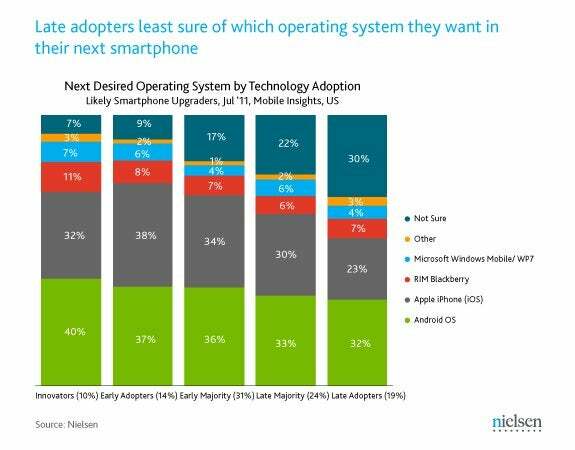 About 40 percent of the earliest of early adopters (Nielsen calls them innovators) surveyed are looking for an Android phone in the next year, while 32 percent want the iPhone. Among the next tier of early adopters, iPhone and Android are about even, and the same is true for the early and late technology-adopting majority of mobile-device users planning to buy a smartphone. Late technology adopters (about 19 percent of those surveyed) also favor Android over iOS, 32 percent to 23 percent, respectively. But the real battleground for smartphone makers appears to consist of people who are unsure about which device they want next. Late technology adopters have the largest block of undecided shoppers looking for a smartphone in the next year. A full 30 percent of these smartphone holdouts, who may still be clinging to their feature phones, have yet to commit to a smartphone candidate. The late-adopting majority has the next-biggest block of undecided smartphone shoppers at 22 percent, followed by the early technology-adopting majority at 17 percent. “In politics as in smartphones, these ‘undecideds’ will be the ones device makers will be hoping to win over,” says Don Kellogg, Nielsen's director of telecom research and insights. The smartphone wars are like politics? Maybe Apple's next marketing slogan should be, "Yes, iCan."